History of the Township of Hauxley, Northumberland. In the field in front of Hauxley hall there is a pillar which bears the following inscription: `This portion of the Hauxley property was redeemed to its hereditary course by the zeal and exertions of the Rev. Joseph Cook of Newton-hall, through the medium of a suit in the Court of Chancery, commenced January, 1798, terminated May, 1809.' Unfortunately this field or ` portion of the Hauxley property' was not part of the patrimonial estate of the Widdringtons, but was purchased in 1762 from Kirton's mortgagees. 1630, 22nd July. Indenture of bargain and sale from Sir William Hewitt, knight, and Thomas Hewitt, esq., his son and heir, to Richard Brown and Thomas Palfrey of several tenements in Hauxley and two parcels of land in Amble to hold in fee farm, rendering to the king £16 4s. 1d., etc. Mr. S. F. Widdrington's Papers and Rev. John Hodgson's Collection, E, 2. Mr. S. F. Widdrington's Papers. Also schedule of Amble and Hauxley Deeds, Rev. John Hodgson's Collection. Land Revenue Record Office, Surveys, York, Hen. VIII., Mary, James I., 7, fol. 118. Date of the copy of John Clark, the father. Since my last letters dated 21st of this instant and sent by Lawrence Rushforde, which I think is hardly comed to your lordship's handes, I have had true and certayne intelligence that Mr. Warde and one Creswell ar presently to erect a winde milne at Hauxeley towne, wherunto, by cause Mr. Warde is the kinge's surveyor, they meane to hynde the whole sukken and grist of both these townes of Ambell and Hauxeley to that milne. I do assuredly knowe your lordship will be dampnefyed £20 yearely rent in the next lettings of Warkworth milnes. To prevent this I knowe no way as yet onely that the towne of Ambell doe pay every tennant a bushell of barley yearly to the milnes of Warkeworth, and as I yet can learne ar tyed to grind at your milnes. Duke of Northumberland's MSS. Land Revenue Record Office, Surveys, Northumberland, James I. vol. 42. Cal. Border Papers, Bain, ii. pp. 78, 79. Mr. S. F. Widdrington's Papers. Ministers' Accounts, 30-31 Henry VIII. Ibid. i. p. 227. Rawl. in Bibl. Bodl. Codex, B, 332, fol. 5o. Gibson, Tynemouth Monastery, i. p. 184. Cott. MS. Claud. E, iv. fol. 236 b et seq. Gibson, Tynemouth Monastery, p. 45. Prior de la Mare was confessor to Lady Mary Percy, who was wife of Henry Percy, baron of Alnwick, and daughter of Henry, duke of Lancaster. From a recital contained in a confirmation charter, 29th June, 55 Henry III. Gibson, Tynemouth Monastery, i. p. 61. Some of these flint arrow heads were exhibited by Mr. Henry Dand at a meeting of the Berwickshire Naturalists' Club held at Powburn, 27th June, 1861. Hist. Berw. Nat. Club, iv. p. 239. Cf. Act I Vic. cap. lxxvii. A mining lease, dated 2nd of April, 1754, was granted for 21 years by the earl of Lichfield and Lord Bellew, trustees of the Radcliffe estates, to John Cook of Togston at the rent of £20 a year. Another lease dated 1st April, 1785, was granted for 9 years by Lord Montague and Sir Herbert Mackworth by the description of 'lords of the manor of Amble' to John Widdrington, and to Edward Cook and William Smith, both of Togston, at £21 5s., but upon condition that the seams of coal be not worked. Mr. E. M. Lawson-Smith's Papers. Cf. Lebour, Geology of Northumberland and Durham, p. 49. The Census Returns are : 1801, 92 ; 1811, 113 ; 1821, 114 ; 1831, 143 ; 1841, 457 ; 1851, 811; 1861 937 ; 1871, 556; 1881, 972; 1891, 1,030. Cf. A paper on Amble and Hauxley, Hist. Berw. Nat. Club, xiv. pp. 87, 255. 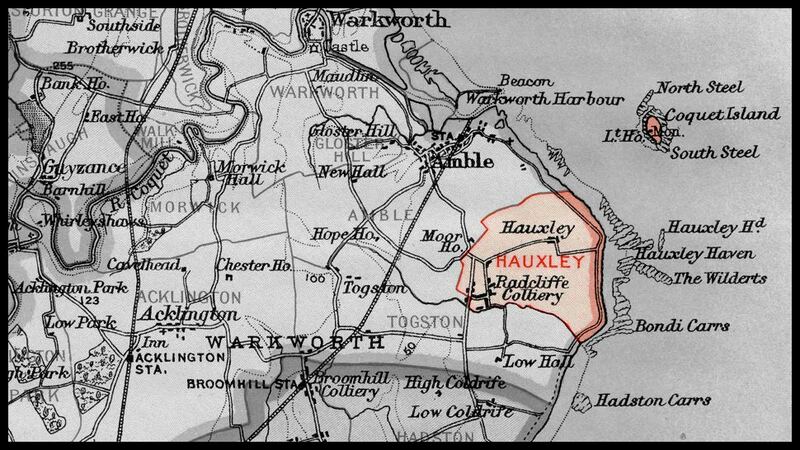 Hauxley Township, part of Warkworth parish pre 1869, and Amble parish post 1869. Notes: 1.) Since this book was written (1899), a Mesolithic midden and Bronze age 'Beaker people' period cemetery has been discovered just south of Low Hauxley, the first cist grave being revealed by costal erosion in 1982. 2.) Hauxley Colliery shaft was not sunk until 1924, therefore the reference to a new shaft in the text below is probably that of Newburgh Colliery, sunk in 1892. 3.) Hodgson refers to the township's costal village by its contemporary description of "Hauxley Sea-Houses", today this is Low Hauxley, with the original Hauxley village now "High Hauxley"
Immediately to the south of Amble is the seaboard township of Hauxley, which, inclusive of Coquet Island, comprises an area of 753 acres. At the census of 1891 it had a population of 1,030. N The village which gives its name to the township stands on a tree-sheltered knoll. It is conspicuous on every side, and embraces an extensive sea view over Druridge Bay to Newbiggin Point, and in certain conditions of the atmosphere even as far as Souter Point lighthouse, near Sunderland. The village consists of one street, at the east end of which is Hauxley cottage, the residence of Mr. M. H. Dand, near which is a one-story cottage retaining a heavy door head with the date 1600 and a window with massive mouldings, a fragment of a larger building, the old mansion of the Widdrington family. On the south side of the street is Hauxley hall, now the property of Mr. S. F. Widdrington, but formerly possessed by the Kirton family ; over the north door in raised letters are the initials and date M. K. 1724. The extensive and productive gardens surrounded by high stone walls were laid out and added to after the house was purchased by John Widdrington about 1762, and the park-like field which stretches to the south and west was probably planted with clumps and strips of trees about the same period. Until sixty or seventy years ago there was a heronry in the park, and there is still a rookery. The township also contains the fishing hamlet of Sea-houses, the homesteads of Bondicar and Amble Moor-house, and the mining village of Radcliffe colliery. Though there are traces of old workings, the coal-field underlying this township and that of Amble was unwrought in modern times N until 1837, when a company was promoted for that purpose. Since then operations have been carried on with considerable success, and the population is now more than tenfold what it was at the beginning of the century. Another shaft has recently been sunk which, though not within, is very close to, the township boundary. About 300 hewers are employed by the Radcliffe Coal Company, and there is an output of about 850 tons per day. The stell fishery for salmon belongs to the duke of Northumberland, N and the white fishery, which before the dissolution of the monasteries belonged to the prior and convent of Tynemouth, belongs to Mr. S. F. Widdrington. There are about sixteen families of fishermen now residing at the hamlet of Sea-houses, who until twenty years ago lived in cottages in the village of Hauxley: There is also a station of the National Lifeboat Society and of the rocket brigade. Lobsters of very fine quality are caught here in great numbers. Up to the beginning of this century the fishermen and others prepared and burnt great quantities of kelp. The seaweed N was cut from the rocks at low water during the summer months and carried in panniers on the backs of ponies to the links, and there dried in the sun. Circular hollows, 3 or 4 feet wide, were dug in the ground and set round with stones ; in them the seaweed was placed and fired. The liquid which exuded was worked with iron rakes into a uniform consistence, which on cooling consolidated into a heavy dark-coloured alkaline substance, and after being subjected to a refining process was used in the manufacture of glass and soap. £. s. d. s. d.
Summa hujus villae, £13 0s. 1½d. Unde domino regi, 23s. 7¾d. 'A noble homme e sage Richard, priour de Tynemuth', Williem Ridel e Richard de Emeldon' iadiz gardeyns de la pees en le counte de Northumbr' salutz e bon amour. Pur ceo qe nous avons entenduz qe vous avetz en vestre prisone un Nichol de Haukeslawe e le dit Nichol fuyt un de eux qe renderent le chastel de Mitford a nous a grant profit e salvcion de tut le pais de Northumbr' e par quel fait nous les resceums par commissione qe nous aueioms de nostre seigneur le roi a la pees nostre seignur le roi par certeyns conditions. Cest a savoir qe le roi lour graunta sa chartre de pardoun de toutz maneres des trespas qils vrent faitz devant ces heures. Sur quoi nostre seignur le roy lour graunta par assent de soun counseil de grauntir e performyr totes les condiciouns qe nous les grauntams e a eux de ceo fyt sa chartre. Par quoi sire vous comaundoms de par le dit nostre seigneur le roi e prioms de par nous meismes qe vous soeffretz le dit Nichol avoir les condiciouns les qeux nous luy grauntams et qe vous ne luy detenetz en prisoun pur nule fait devant le rendre du dit chastel. Issynt qe altres de cele condicioun ne preignent ensample en le secle qe uncore est dotous le leuyr encountre la pees par quoi qe le pais porra venyr en greyndre riote qe ore nest. En tesmoigneaunce de quele chose a testes lettres patentes avoms mys nos seals. Escript a Noef Chastel sur Tyne le venderdy en la veel del Assumpcion de Notre Dame lan du regne le Roi Edward filz le Roi Edward quinzlsme.' Tynemouth Chartulary, fol. 212 b.
Pateat universis per presentes quad nos Adam de Haukeslawe, Willelmus filius Thome de eadem, Rogerus filius Willelmi flii 'Thome, Robertus de Raynham, Rogerus filii Willelmi filii Rogeri, Robertus Savvage, Johannes filius Walteri, Robertus de Seton' de Tynemuth, Johannes Curtys, Willelmus del Kiln', Ricardus filius Galfridi, et Rogerus filius Thome de Haukeslawe recepimus in ballium corpus Nicholai de Haukeslawe videlicet unusquisque nostrorum per se corpus pro corpore. Ad hahendum et intrandum corpus predicti Nicholai in prisona de Tynemuth' ad proximam deliberacionem prisone predicte apud Tynemuth. Et ad conservandum priorem de Tynemuth et Thomam de Raynton' ballivum libertatis de Tynemuth indempnes et quemlibet eorum indempnem versus dominum regem et quoscumque alios racione tradicionis balii predicti. Et quod dictus Nicholaus bene et fideliter amodo se habebit ad pacem et ad fidem domini regis. Et ad ista singula predicta obligamus nos heredes et executores nostros et unumquemque nostrorum insolidum per presentes sigillis nostriae signatas. Date apud Tynemuth die veneris in festo Sancti Oswyni regis et martinis in autumpno anno regni Regis Edwardi filii Regis Edwardi xvo.' Ibid. fol. 213. All the tenants of Amble, beinge xiiij whole tenements, and all the tenants of Auxley, beinge x, doe paie yerlie for pannage of their swyne within the mannor id per farme, in all iis per annum. Edwarde Hudson, Alexander Driden, and Archibald Atcheason houlde the fishing ther, consistinge of iii cobles for which they pay xxtie fishes per coble, every fishe rated at iiiid amounteth to vjs viijd per coble, it beinge by auncient custome, per annum in toto xxs. Annual value beyond the rent, 6s. 8d. Henrie Wooddrington, gent., houldeth ther the office of baylie of Ambell and Auxley by letters patentes graunted him scince the kinge's cominge to the crowne, and hath yeerlie fee xxvjs viijd. Item, there is one Cuthberte Creswell, gent., that offereth to build a new wyndmill N within the mannor aforesaid att his owne charges, and will aunswere unto his majestie and his successors for the same the yerely rent of iiis iiijo which wee deeme good service to his highnes and necessarie for the tenauntes, havinge noe mill to grind att save att the earle of Northumberland his mills att Warkeworth which is distant from Auxley twoo myles. SURVEY OF HAUXLEY, SEPTEMBER, 1608. Copyhold Tenant. Former Tenant. Date of Copy Rent Annual Value beyond Rent. By examination of the tenants and neighbors of Auxley it is affirmed that the mynes of cole there are drowned, yet there is myne of cole enoughe if the water could be overcomed ; the pitts are viii or ix fathom in depenes and three-quarters in thicknes ; a reasonable good burnyng cole, but what charge will wynne the said myne cannot certenly be knowen, nether what other seame of cole in the same ground can or may be discovered. Thomas Tweddy of Ambell, aged fortie yeres, one of the hewers within the cole pitt there by the space of seaven yeres, sayeth that there is only one pitt wrought, and now in the tenure of Edmond Fynche and Henry Kirton by leave or covenant from one Mr. Humerston. He sayeth the pitts are and wilbe in depenes about 4, 5, or 6 fathoms, the seame half a yard thick. A caking coale fitt for fyer or salt pans. There is great quantitie of myne to endure for many yeres, if the water could be drawn or wonne; the roof is bad and falls of itself. He sayth that they could worke more if there were more vent or sale, and is verilie persuaded that his masters doe not gayne above ten pounds per annum, and knoweth of noe other mynes there likely to be discovered. The immediate ancestors of Robert Widdrington, whose name stands at the head of the above list, besides being customary or copyhold tenants in the township, acted as bailiffs, first of the priory of Tynemouth, and after the dissolution as bailiffs and collectors for the Crown. He was also lineally descended from Sir Gerard Widdrington, whose claim upon the manor of Hauxley in the fourteenth century, though defeated at that time, was, in part, realized, and has been maintained by his descendants. INVENTORY OF ROGER WIDDRINGTON OF HAUXLEY, 23RD MARCH, 1587/8. Inprimis: His coyne, apparell, and other furniture, £7 16s. In the hall: 2 counters or tables with 4 trussels and 5 formes, 8s. ; 2 carpet clothes for table, 3s. 4d. ; one halfe dosen of cuishions, 2s. ; 2 chaires, 1s. 8d. ; one iron chimney, one paire of tonges, and one porre, 6s. In the upper bed chamber: 2 bedsteades with all the beddinge, £5 16s. ; 2 webbes of wollen clothe, £1; one chaire, one counter, 2 cupbordes, and 4 chistes, £1 6s. 8d. In the litle chamber: One presser and 4 bedsteads with the beddinge, £1 13s. 4d. In the parler: 4 bedsteads with the furniture or beddinge, £2 13s. 4d. ; one counter, one olde chist, and one chaire, 3s. 4d. ; one banded coffer, 2 cradles, and one chist, 6s. 8d. ; one almorie, 13s. 4d. ; one iron chimney, 6s. 8d. ; the servants' beddinge, 6s. ; the nappers and linninge, straiken, and hardinge, £3 9s. 4d. In the larder and butterye: 2 heist tubbes, one olde cupborde, one cheese presse, 8 lyenge barrels, 4 standinge barrels, and 3 tubbes or guile fattes with all the other woodden vessals, 16s. ; one basin and one ewer, 3s. 4d. ; one salt of silver, single guilt, and one halfe dosen of silver spoones, £3 6s. 8d. ; one tin salt, one dosen of tin spoones, and fower candlesticks, 3s. 4d. In an olde caphouse above the butterye: Twooe bedsteads, 1s. In the kitchin and brewhouse: One leade and one maskinge fat, 15s. 10d. ; 36 peices of pewder vessals, 8 pottingers, 10 sawcers, and 11 plate trenchers, £1 12s. ; 2 greate braise pottes, 2 lesser pottes, and one posnet, £2; one copper kettle and 2 pannes, 8s. ; 2 iron spitts, 4 crooks, one broylinge ron, and one jibcrooke, 5s. 8d. In the boutinge house: One arke, one boutinge tubbe, one breade brake, one mouldeing horde, and a rouse cawle, 4s. 4d. In the malt house and kilne barne: 5 malt chistes, one stepinge fat, and one goose cawle, £4. Corne: The harde come, £27; the beare or bigge, £5 the oates, £9 6s. 8d. ; the pease, 6s. 8d. ; the harde corne at Morwicke, £3 3s. ; the otes at Morwicke, £1 17s. 4d. ; the beare, 15s. Cattell and lyvinge beastes: One olde geldinge, £1; one yonge geldinge, £2 ; 4 mares, £4 13s. 4d. ; 5 draught oxe, £20 ; 2 mart oxe, £2 ; 5 kyne and 3 calves, £5 ; one oxe, one stot, and 4 quyes, £2 10s. ; 19 sheepe, £2 13s. 4d. ; 8 swine, 13s. 4d. ; the geese and the hennes, 7s. 8d. Husbandrye geare: The waines, ploughes, and iron sowmer, with all other the instruments and furniture perteyninge to husbandrye, £3 4s. 4d. In the stable: One ote chist, 2s. ; 2 saddles and 2 bridles, 5s. Fishinge lines: The great lines and small lynes, 5s. 4d. ; 2 eases, £6 6s. Debts owinge to him, £4 15s. 8d. Debts owinge by him: For one wholle yeare's [?rent] of his tenement in Hawkesley, £4 4s. 3d. ; for one wholle yeare's rent of the conye warrant, 10s. ; for the Baylif s medowe, 4s. ; for the wholle yeare's rent of his parte of a coble, 18s. ; to Margerye Wootherington, his sister, for her whoole childe's porcion, £30; to Jane Wooddrington, an other sister, for the last part of her porcion, £17 1s. 8d. ; to maide servants for their wages, 11s. 3d. ; to men servants, £2 18s. ; to Robert Staper, £1 6s. 8d. ; funerall expenses, £3 6s. Total, £60 19s. 10d. * Portraits by Signor Toffano and by Weigall are at Newton. † Portrait by Weigall, exhibited at the Royal Academy, is at Newton. 1588, 28th March. Administration of the personal estate of Roger Widdrington of the parish of Warkworth granted to Robert Widdrington the brother ; Henry, Claudius, Marcus, and Elizabeth, the children of the deceased being under age. Raine, Test. Dunelm. 1597. Robert Widdrington of Hauxley was one of the jury which was alleged to have stirred up Lord Eure's tenants in Sturton Grange, etc., to complain against him. Cal. Border Papers, Bain, ii. p. 341. 1664, 17th September. Will of William Widdrington of Barnhill, gent. To be buried in the chancel of Warkworth amongst my predecessors ; my only child Anne, my kinsman Sir Ralph Delaval, Bart., my wife Barbara executrix, my father Robert Widdrington of Hauxley, esq., supervisor. Proved 5th January, 1665. Raine, Test. Dunelm. 1683, 3rd May. Indenture between Robert Widdrington of Hauxley, esq., of the first part, Sir Ralph Delaval of Seaton Delaval, bart., of the second part, and Ann Widdrington of Brenkley, gentlewoman, grand-daughter of the said Robert Widdrington, of the third part; to secure the payment of £600 as a portion of the said Ann Widdrington. Barbara Fenwick of Brenkley, widow, mother of the said Ann Widdrington, party to the deed. Mr. S. F. Widdrington's Deeds. 1684, 28th May. A settlement whereby Robert Widdrington the elder settled his estates and lands in Hauxley, Amble, Warkworth, Guyzance, Barnhill, Hartlaw, and Hazon upon his nephews Robert Widdrington the younger, the eldest, Thomas the second, and Henry the third, sons of his brother William Widdrington, successively, in tail male, with remainder to Robert Widdrington, son of Samuel Widdrington, gent., who was another of his brothers. The estates are charged with annuities and portions payable to his daughters, Elizabeth, wife of Cuthbert Karns (or Cairns), of Firth-house, gent. ; and Isabel, wife of Robert Fenwick of Nunriding ; and to Robert, Jane, and Frances Forster, the children of his daughter Ann Forster, deceased ; and to Robert Maxwell, son of his daughter Mary, the wife of Edward Maxwell, gent. Certain sums are also to be paid to Henry, Ralph, Elizabeth, and Frances, children of William Widdrington, brother of the said Robert. Mr. S. F. Widdrington's Deeds. 1692, 28th May. Will of Robert Widdrington of Hauxley, esq. To be buried in the parish church of Warkworth. To my nephew Robert Widdrington of Hauxley, jun., my lands and tenement in Guyzance, viz., my two freehold tenements and also my tenant right to those two tenements and my proportion of Ormelee, Coat Ryall and Newstile in the same township of Guyzance, which I hold by lease of the duke and duchess of Somerset ; to my said nephew Robert Widdrington all my stock, chattels, horses, oxen, sheep (except 4 kyne of the best I have and a mare which I bought and I give to my wife Dorothy Widdrington). My wife to have summer grazing and hay for winter food for 4 kine and mare, and enjoy 2 chambers in my dwelling-house at Hauxley, viz., my own chamber where now my papers lye and the little chamber next adjoining to it to live in for the time of her life. Household stuff to be divided between said nephew and my wife ; my son in law Mr. Edward Maxwell, £180; my grandson Mr. John Fenwick, £100 ; both sums to be paid out of Guyzance. Ibid. 1733, 16th August. Will of Frances Widdrington, junior, of Hauxley. To my brother John, £100 ; to my sister Dorothy, wife of Thomas Smith of Togston, £40 ; to my sister Ann, wife of Edward Young of Togston, 40s. ; to John, son of my brother Robert Widdrington, £8 ; ` being the remainder of what effects Providence has allotted me in this world.' Proved at Durham, 1733. Ibid. 1747, 5th July. Will of Robert Widdrington of Hauxley. My lands in Hauxley, Amble, and Alnwick to my eldest son John Widdrington, subject to portions of £300 apiece to each of my younger children, Nathaniel, William, Sarah, Frances, Mary, and Elizabeth. 1767. His grace the duke of Northumberland has appointed John Widdrington of Hauxley, esq., to be his grace's auditor in the room of Richard Seymour, esq., who has resigned. Newcastle Courant, 14th March, 1767. 1780, 31st March. Will of Isabella, widow of John Widdrington of Hauxley. I quit-claim to my husband's heirs and executors all my right to the £1000 settled upon me at my marriage. To my sister Elizabeth Mills, wife of Henry Mills of Willington, all my fisheries in the river Tweed as devised to me by the will of my late uncle William Kettilby, esq., of East Orde ; to my sister Anne Fenwick, £1000 ; to John Fenwick of Bywell and to William Fenwick his brother, 100 guineas apiece ; to my mother, 20 guineas for a ring ; to Mrs. Ward of Alnwick and her sisters, 10 guineas apiece, ` as a small token of my sense of their great goodness to me, which I beg may be laid out in any memorial of their grateful friend.' The portrait of my dear husband to Charles Brandling, esq., of Gosforth house. Residue to the children of my sister Elizabeth Mills (her eldest son being excepted). My brother in law, Henry Mills, executor. Proved at Durham, 14th April, 1780. Mr. S. F. Widdrington's Deeds. 1783, 28th April. Will of Nathaniel Widdrington of Hauxley. To my nieces Sarah Brown and Sarah Teasdale, £300 apiece ; to Nathaniel Punshon, £10 ; to Mr. Adams, £10 ; to Samuel Bell of Hauxley, £10; to my servant Mary Muers, £20 a year and the wearing apparel of my late mother. My real estates at Hauxley, Amble, Guyzance, and Alnwick, to my cousin John Widdrington of Newcastle, esq. Proved 17th July, 1783. Ibid. 1783, 6th August. Will of John Widdrington of Newcastle. To my wife Jane Widdrington, £100 per annum out of Hauxley, my house in Hanover Square, Newcastle, and my lands in Whickham, she executrix. I give one moiety of my lands in Hauxley, Amble, Guyzance, and Alnwick to Sarah Brown and her heirs male ; and the other moiety to Sarah Teasdale and her heirs male ; cross remainders ; remainder to William Smith the younger son of my cousin William Smith of Worcester. 1798, 27th February. Administration, with will annexed, of John Widdrington, granted to the Rev. Joseph Cook and David Latimer Tinling. Ibid. At the south side of St. John's church, Newcastle, there is a tombstone bearing the following inscription : 'The burial place of Robert and Jane Widdrington, cordwainer, Newcastle. Jane, their daughter, departed this life July 10th, 1806, aged 12 years. The above-named Robert Widdrington departed this life July 21st, 1806, aged 60 years. Also two of their children died in infancy. Michael Widdrington, son of the above Robert Widdrington, departed - this life June 1st, 1826, aged 21 years.' These persons were descended from a certain Robert Widdrington, an officer of the Life Guards, who, after spending his patrimony, returned to Northumberland and resided at Quarry-house, Westgate, where some of his children were born, and afterwards baptised at St. John's. He is asserted to have been a cadet of the Hauxley family ; if that were so, he may perhaps be identified with Robert, son of Samuel Widdrington, whose name occurs in the deed of entail made in 1684. His eldest surviving son, Thomas Widdrington, married, 4th November, 1744, at St. John's, Dorothy Richardson, and was buried at the same place on the 22nd of July, 1770, having had at least three sons, Robert Widdrington, a shoemaker in the Middle Street; Thomas, a publican in Gateshead; and Michael, a shoemaker in Newcastle. Robert Widdrington, the eldest of these three (as the above monumental inscription relates), died in 1806. He married, first, 1st August, 1775, Margaret, daughter of John Anderson of Wylam, and widow of Thomas Brown of Newcastle ; she died without issue, 8th July, 1791 ; by Jane, his second wife, he had eight children, viz. : (1) Robert; (2) Thomas, who married, 13th November, 1820, Jane. daughter of John Dobson of Newcastle, upholsterer ; (3) Hugh ; (4) Michael, died unmarried, 1826, aged 21 ; (5) Dorothy, married, 12th June, 1815, James Horsley of Newcastle, linendraper ; (6) Jane, died in 1806; and two children who died in infancy. St. John's church M.I. (Bell Collection), with the Society of Antiquaries of Newcastle. John Widdrington, the last male (so far as is known) of this ancient family, before succeeding to the estate, was a merchant and banker in Newcastle ; he had travelled, and was a man of urbanity and taste, with a competent knowledge of natural philosophy. He enlarged and improved the already extensive gardens at Hauxley by the erection of a long glass house, in which his delicate south-country wife might take exercise without exposure to the east wind. In fulfilment of a promise exacted from him by his predecessor, he gave the Widdrington estates to his two nearest paternal kinswomen, Sarah Brown and Sarah Teasdale, in moieties, with the injunction to take and use the name of Widdrington. But through his commercial speculations in Newcastle and his connection with the ` Old Bank,' his affairs on his death in 1797 were found to be in such disorder that a Chancery suit was required to adjust them. This lingered for eleven years, N and resulted in the alienation of half of the estates for the payment of the testator's debts. Miss Teasdale married Captain David Latimer Tinling, afterwards Major-General Sir David L. Tinling Widdrington, and their son, the Rev. Sidney Henry Widdrington, formerly a captain in the 53rd regiment, in 1842 sold his moiety of the estate to Captain S. E. Widdrington of Newton-on-the-Moor, who by descent had succeeded to the moiety of his mother, Sarah Brown (afterwards Widdrington), wife of the Rev. Joseph Cook. Of the family of Kirton which, in 1663, held more than a sixth part of the township, very little is known. Their house, as part of Hauxley hall, still stands, their lands lay to the south-east of the village, and their homestead is said to have been situated at the Sea-houses. Their disappearance followed, and may have been the result of the lawsuit in which they became involved with the Widdringtons in 1735, though it was not until 1762 that John Widdrington purchased the estate from Ord and Wilson, who appear to have been Kirton's mortgagees. (a) Warkworth. Register. (b) Mr. S. F. Widdrington's Papers. (c) Durham Probate Registry. (d) Alnwick Register. 1653. Administration of the personal estate of Henry Kirton of Hawksley, in the county of Northumberland, granted to Robert Widdrington, grandchild by the mothers side. Durham Probate Registry. 1694/5 6th March. Will of Edward Kirton of Hawxley, gentleman : My body to be buried in the parish church of Warkworth. I give to my wife, Jane Kirton, the sum of £160 (£100 of which sum is part of the fortune my said wife brought to me, and at present in security in the hands of her brother, Thomas Kelly). I give, devise, and bequeath unto my son, Matthew Kirton, all my lands in Hawxley upon condition that he pay thereout the sum of £70 each to my daughters Sarah and Rachell Kirton at the age of 21 years or marriage. My trusty friends, George Lawson of Gloster-hill and Robert Valentine of Warkworth, executors. Ibid. 1694/5, 19th March. Inventory of Edward Kirton of Hauxley. His purse and appareill £6 ; 8 oxen, £34. ; 7 kine and calves, £21 5s. ; 5 quyes and 1 stot, three yeares old, £14 ; 4 quyes and 1 stot, two years old, £8 15s. ; 3 stots, 2 quyes, one yeare old, £4 ; 6 horses and mares and a filly, £16 6s. 8d. ; 58 wedderes, £24 13s. ; a sow, 2 piggs, and a hogg, £1. `Corne in the stackgarth at Hauxley,' 27 new boules of wheat, at 5s. per boule, £6 15s. ; 60 old boules of bigg, £30 ; 50 old boules of oates, at 6s. per boule, £15. ` Corne in the stackgarth at Bondy Carr,' 17 new boules of wheat and rye, at 4s. p. boule, £3 8s. ; 10 new boules of blandlings, at 3s. p. boule, £ 1 10s. 15 boules of oates at West Chevington, at 5s. 6d. per boule, £4. 2s. 6d. 11 new boules of wheat and rye sown at Hauxley, the increase whereof at 4 boules for one, and at 4s. 9d. p. boule, £10 9s. ; oats sowne on the ground, 9 old boules, the increase thereof at three boules for one is 27 boules, and the price at 6s. p. boule, £8 2s. ; pees sowne on the grounde there, 17 new boules, the increase thereof at 3 boules for one, and the price at 3s. p. boule, £7 13s. 6 newe boules of wheat and ry sowne at Bondycarre, the increase thereof at foure boules for one, and the price at 4s. 9d. p. boule, £5 14s. ; oates to be sowne there, 8 olde boules a bushell, the increase at 3 boules for one, and the price at 6s. per boule, £7 13s. ; peese sowne there, 6 new boules, the increase at 3 for 1, and the price at 3s. p. boule, £2 14s. ; bigge to be sowne there, 6 new boules, the increase at 6 for one, and the price at 3s. 4d. p. new boules, £6 ; old hay, £6 ; implements of husbandry, £12 2s. 6d. ; household stuff of all sorts, £10 13s. 10d. ; total, £267 16s. 2d. Ibid. 1710, 10th July. Matthew Kirton conveys his lands at Hauxley to William Wharier of Birling to secure £200. 1730, 18th November. Matthew Kirton conveys his lands at Hauxley to Anne, youngest daughter of Robert Lisle, late of Weldon, to secure £200. 1762, 4th November. John Widdrington of Hauxley purchases from the mortgagees Kirton's lands in Hauxley for £2,600. Hauxley Deeds. (a) Warkworth Register. (b) Mr. M. H. Dand's Deels. (c) M.I., Warkworth. (d) Gentleman's Mag. (e) Mr. S. F. Widdrington's Papers. (f) Durham Probate Registry. 13th October, 1735. Affidavit of William Clark of Eslington [? Ellington], gent., aged 89 years and upwards. Was born at Hauxley and lived there from his birth for forty years and upwards. That his father, John Clark, was seised of an estate in Hauxley until his death, which happened about forty years ago, which estate at his father's death descended to this deponent as heir-at-law, and was enjoyed by him for ten years and upwards after his father's death. 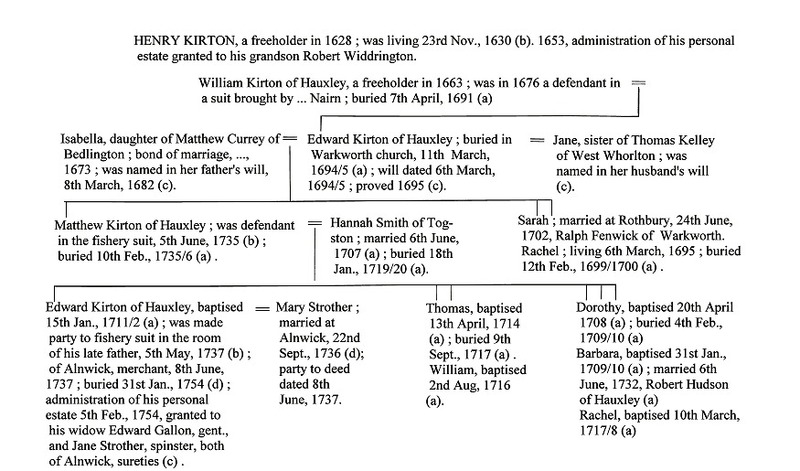 That he knew William Kirton, grandfather of defendant, Matthew Kirton. Mr. S. F. Widdrington's MSS. Margaret, daughter and heiress of John Clark, in 1779 became wife of William Richardson of North Seaton, and their surviving daughter and sole heiress married Ralph Clarke of Lower Tooting, near London, a man of Northumbrian origin, and possibly a kinsman of his wife's maternal ancestors. Having survived his wife, he sold her estate at Hauxley in 1815 to Edwards Werge of Horton in Glendale, who already owned another part of the township. Werge in 1820 sold all his lands in Hauxley and Amble townships to Mr. James Dand, whose son, Mr. M. H. Dand, now owns and resides at Hauxley cottage. The lands which, in 1663, belonged to John Hudson were acquired from his descendant Robert Hudson in 1736 by Robert Widdrington and absorbed in the Widdrington estates. The lands owned in 1663 by Robert Hall were in 1698 conveyed by John Hall to William Cresswell, from whose successor, John Cresswell of Cresswell, they were purchased in 1775 by John Widdrington. Cresswell's house stood at the west end of the village on the south side of the road. (a) Warkworth Register . (b) Will of William Cresswell of Cresswell. Hodgson, Northumberland, part ii. vol. ii. p. 202. (c) Abstract of title of lands at Long Framlington. Rev. John Hodgson's Collection, M, 190, etc. (d) Mr. Thomas Clutterbuck's Commonplace Book. (e) Durham Probate Registry. * ' Thursday se'nnight, at Hauxley, Mr. William Cresswell, nephew to the late William Cresswell of Cresswell, esq.' Newcastle Courant, 4th Sept., 1773. † 1785, 26th May. Henry Cresswell of Billingsgate, fishmonger, in consideration of the sum of £450 conveyed a burgage in Warkworth to John Watson. Miss Erskine's Deeds. 1806, 7th Aug. At Ramsgate in his 64th year Henry Cresswell, esq., of Great St. Mary's-at-Hill, London, many years a representative of the ward of Billingsgate in the Common Council. Gentleman's Magazine, 1806. Baptisms at Warkworth : 24th July, 1707, John (buried 8th May, 1708) ; 10th May, 1709, Henry ; 20th July, 1712, Francis, all sons of Henry Cresswell of Hauxley ; and 3rd Sept., 1716, Jane, daughter of Henry Cresswell of the Hope (buried 18th Oct., 1716). Warkworth Register. Keep off the rocks of Bondicarr. CARR AND ROCHESTER OF BONDICAR. (a) Raine, Test. Dunelm. (b) Raine, Test. Ebor. (c) Hist, of North. ii. pp. 429, 432. (d) Milford Register. (e) Warkworth Register. (f) Newcastle papers. (g) Bondicar Deeds. (h) Whalton M.I. (i) Whalton Register. * Cf Hist. of the Family of Carr, iii. pp. 25-31. 1620, 1st April. Will of Roger Carr of New Moor-house. To be buried in the church of Lesbury; to my eldest son Thomas Carr, my two farms in Lesbury, held of the earl of Northumberland, and my farm in Hauxlawe after my mother's death : my wife Mary and my son Thomas executors. My second son John, my eldest daughter Jane, second daughter Katherine, third daughter Barbary, fourth daughter Dorothy, my third son Mark, my fourth son William, fifth son Roger, my youngest son Lancelot. The testator owes to Mr. John Lysle of Acton, Mrs. Mayners of Framlington, Barbary Mayners of Framlington. Proved 6th July, 1622. Raine, Test. Dunelm. 1657, 27th June. Will of Thomas Carr of Hauxley. To be buried in Warkworth church. To my eldest son William Carr, my land in Lesburie ; to my younger sons John and Robert, the crop at Lesburie, etc. ; to my wife Anne, four oxen, my crop of Hauxley, etc. ; my crop at Hadston ; my brother Lancelot Carr. Witness, Robert Widdrington. Proved 1661. Ibid. 1661, 2nd February. Will of John Carr of Hauxley Link-house. To be buried in Warkworth quire. My uncle William Widdrington of Todburne, my aunt Mary Carr of Lesbury, £5 ; my brother William Carr owes me 5 due to me by my father's will ; to my cousin Roger Carr, son to my uncle Roger Carr of Newcastle ; my cousin Jon his sister ; my cousins Ealiner Law of Alnwick, William son of my aunt Mary Carr, Roger another son ; my cousin Mary Donnington of Whitbee ; my cousin Anne Carr of Monelawes ; my cousin Peter Bush's children ; my cousin Ralph Carr. Witness, William Widdrington. Proved 1662. Raine, Test. Ebor. 1749, 19th December. Will of Oliver Carr of Nunriding. To be buried at Mitford. My wile Joanna Carr ; the farm of Bondicar in the parish of Warkworth, with a close called Carr's Moor, and a tenement at Hauxley are settled by deed dated 16th December, 1749, upon my said wife during her widowhood. My lands in the county of Lancaster to Robert Bulman of Morpeth and John Story of Newcastle, merchant, in trust for my brother John Carr ; my sisters Elizabeth Rochester and Ann Carr, the tenants in Northumberland of Robert Fenwick, esq. of Brough hall, Lancashire, to have gloves and hatbands. Margaret Carr now living with me. My brother John executor. Proved at York. 26th April, 1750, by his sister Elizabeth, wife of John Rochester. Ibid. From the beginning of the eighteenth century down to 1870 the family of Hall, originally from the parish of Elsdon, were tenants of Bondicar. (a) Warkworth Register. (b) M.I., Warkworth. (c) M.I., Blyth churchyard. * 1748. Joseph Hall of Bondicar voted for lands at the Shaw in the parish of Elsdon. Poll Book. † William Hall entered the Bank of England 26th Jan., 1796, and was appointed a cashier Nov., 1837. Below, Radcliffe today. Only a few buildings remain, most being demolished to make way for opencast mining. Radcliffe Colliery closed at the end of the 19th century, the village at that time had a population of over 900. Radcliffe, not much to see - just a few buildings remain close to the main road. View of the remains of Radcliffe village from the old colliery site. The village colliery rows spread across this field. A view in the opposite direction to the previous image; Radcliffe colliery stood where the trees are now. Where the Radcliffe war memorial stood - it was moved to Amble when the village was demolished.